The dive site Sherwood Forest is an offshore rocky reef in the Partridge Point area on the Cape Peninsula, near Cape Town in the Western Cape province of South Africa. The site has exceptional sea fans. Probably at or near S34°15.200' E18°29.050'. Sherwood Forest lies between Atlantis Reef and Seal Rock. This site is in a Marine Protected Area (2004). A permit is required. The name "Sherwood Forest" was chosen by the divers on the first recorded dive at this site on 3rd May 2012. Maximum depth is about 30m. and the top of the reef is about 18m. Average depth is likely to be about 25m. This deep reef is made up of jumbled granite boulders, clumped together in patches and dispersed between sandy areas in others. Geology: Granite corestone boulders and outcrops of the Peninsula pluton. Boat access only. The site is about 3.5km from Miller's Point slipway. Because the reef is deep, there are many sea fans, some up to 2m tall. 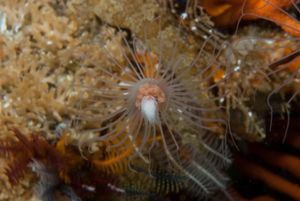 Tubular hydroids, gasflame nudibranchs, silvertips, redspotted nudibranchs and protea dorids can all be seen. Also, hottentot, schools of strepies, and cryptic reef fish like the Chinese klipfish. The site may be visited by spearnose skates. Certification appropriate to the depth is expected. The dive is beyond the depth range for entry level divers. No special equipment is required. A DSMB and reel is recommended to alert the boat crew of your position when surfacing, and to warn other boats of your presence, as this area may carry fairly heavy small craft traffic at times, and the commercial ski-boat fishermen are not all particularly concerned for the safety of divers. This page was last edited on 6 May 2012, at 14:28.